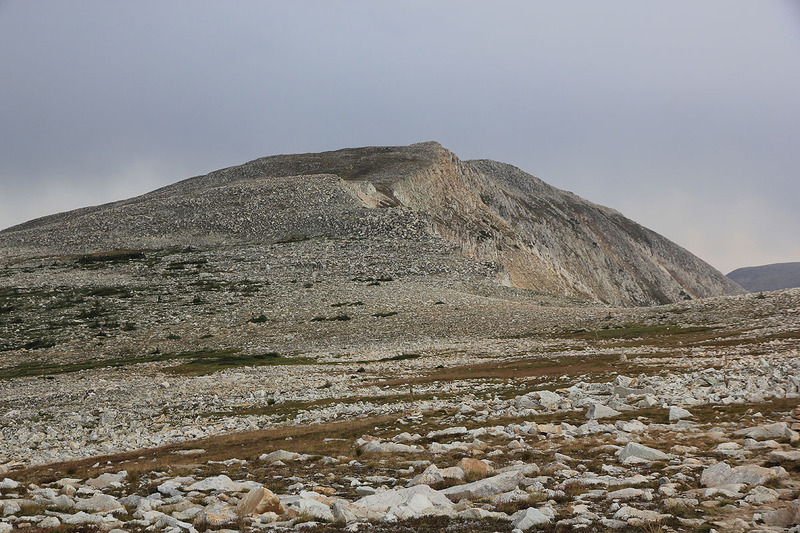 This peak is located directly west of the town Laramie in Wyoming. From the center of Laramie, take Clark street west, it connects to Hwy. 130 also called Snowy Range Road going west (this road also serves the local airport). Stay on Hwy. 130 for about 44 miles, you will now be directly east of the peak. There are two trailheads, this report describes a traverse from south to north. You will get Lake Marie on your right hand side, then locate parking just south of the lake. Park here, this is the trailhead. This location is N41.33141, W106.32569, elevation about 3200 meter. Take the trail that zig-zags uphill in an obvious fashion. Higher up, this trail is heavily marked with big poles as well as cairns, hard to go wrong. 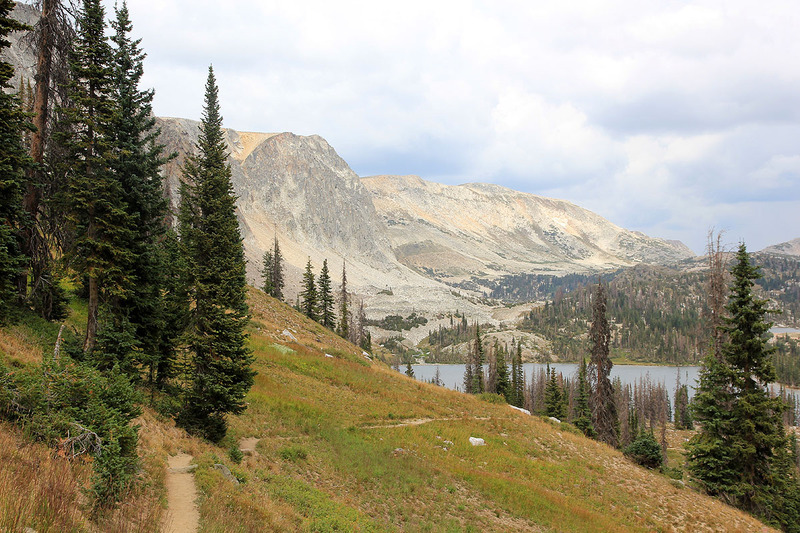 The trail climbs above the tree line and gains a plateau (gentle slope) that lies on the west side of the high ridge. There are some trails merging from the left, however it is pretty obvious which trail will take you to the summit. The summit is quite a bit further along than one would expect, but finally appears as a cone shaped pile of boulders. A shorter trail to this summit exists, we will now describe this as a descent route. Obviously, one may reverse this route or simply do a round trip hike on one trail. Continue across the summit, stay at or close to the summit ridge. You will soon see a trail that heads directly downhill (ie. is to your right (east) hand side). Take this trail. Once down, the trail going west will take you back to the Medicine Bow trailhead, location N41.33848, W106.32308, where there is also good parking. From here, a short hike along the main road will get you back to the Lake Marie trailhead. The circle round trip traversing the summit as described here, is about 11 kilometer, allow 3-4 hours. We had climbed Cloud Peak the day before, then travelled to Casper. A flat tire caused some delays and a late start from Casper. We drove across Hwy. 130 from the west side and parked at the first trailhead, Lake Marie. The time was already 1300 by the time we started. The weather was ok, but I realized that afternoon thunder might cause problems. This guess was unfortunately, correct. 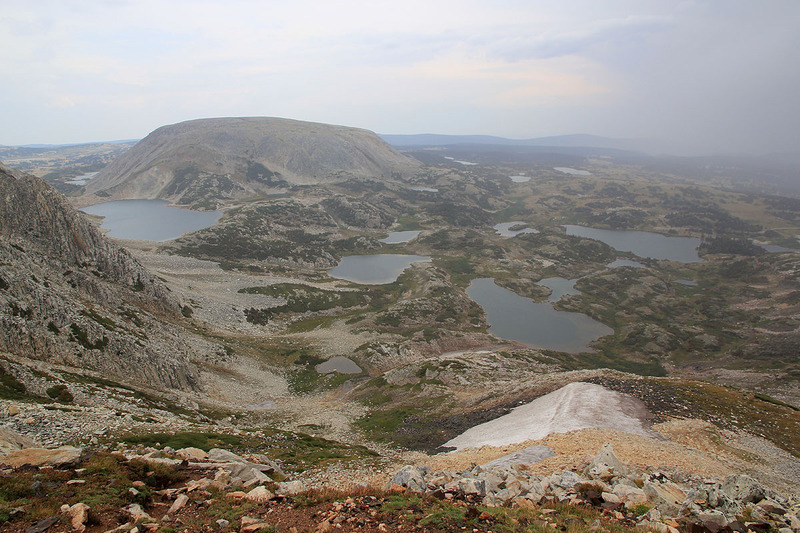 As we reached the terrain above timber line, it started to rain and soon, I could hear thunder off further east. Subsequently, dark clouds also moved in from the west and I saw lightning a bit north of us. We continued with caution trying to evaluate how this would develop. Shortly before the summit area, we agreed to make a break and see if we could wait until the dark clouds with thunder would move off further east. They sort of did, however, a new dark cloud came moving in. We decided to quickly move across the summit between these two events, then escape down the more direct trail on the east side. As we hurried across the summit, I observed a couple hiding for the storm under a big boulder right next to the summit. In fact, a very unsafe place to hide with respect to lightning. I told them to get out and down, then continued my scramble. We were at the summit 1430. It was raining hard and we were hit by hail and windy gusts. Not good. After a short section of slippery rocks we did locate the trail and quickly came down well below the ridge line. The view from this section (as well as from the top) is very nice. I was completely soaked to the skin. Descending further, the weather cleared and the sun came back out making life a bit more comfortable. 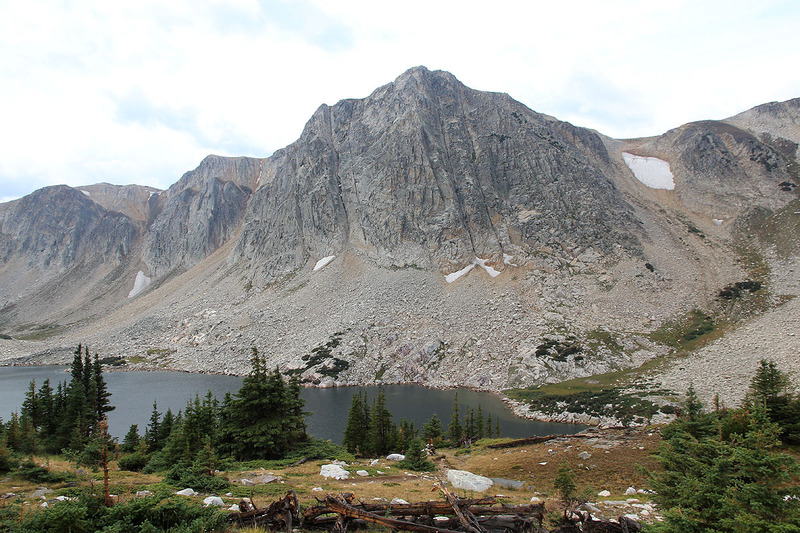 We enjoyed the scenery and completed our round trip hike via the Medicine Bow trailhead back to our car at Lake Marie, arriving there at 1550.